Ships are getting bigger, so they can carry more cargo in less time. This is critical in Florida, where so many more people (i.e. consumers) are now living that we surpassed New York to become the third highest populated state in the United States. And, let&apos;s not forget Florida&apos;s nearly 113 million annual tourists and seasonal visitors who also purchase food, clothing and other goods shipped via ocean. To meet these demands, Port Everglades needs deeper and wider channels so today&apos;s modern ship fleet can arrive here safely. 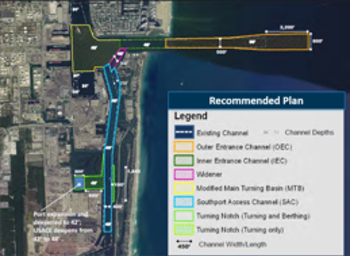 The Port Everglades Navigation Improvements Project is currently in the preconstruction engineering and design phase after receiving a signed Chief of Engineers Report from the U.S. Army Corps of Engineers on June 26, 2015 and U.S. Congressional authorization in the passing of the Water Infrastructure Improvements of the Nation (WIIN) Act in December 2016. Timing for this project is essential as older fleets are being replaced with much larger ships and Port Everglades already handles large ships from Europe and South America that must be lightly loaded because of current safety constraints. The goals are to deepen the main navigational channels from 42 feet to 48 feet (plus 1-foot required and another 1-foot allowable overdepth for a total of 50 feet), and to deepen and widen the Entrance Channel and parts of the Intracoastal Waterway so that cargo ships can pass safely by docked cruise ships. Construction is anticipated to be completed by 2021-2025*, and is expected to create an estimated 4,700 total construction jobs and nearly 1,500 permanent direct jobs locally from the additional cargo capacity. The estimated cost is $389 million (as of October 2016), which will be paid with Port Everglades revenue generated through port user fees, federal appropriations and state grants. No local property taxes will be used for this project because Port Everglades is a self-funded enterprise of Broward County. 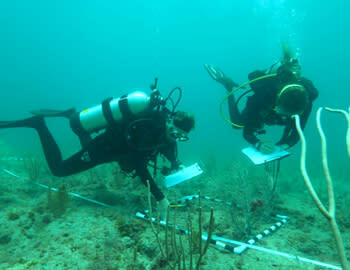 * Assumes one contract for USCG Station reconfiguration and one contract for deepening and widening.